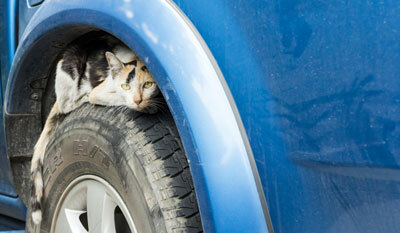 Be mindful: On cold mornings, if your cat is not in the house, it may be under the hood of your car! On a recent visit, Debby's sister tried to talk her into adopting a kitten. Debby loves animals, but didn't really need another cat, and she had her sales resistance at a high level. She left for the drive back to Clarkston without a new kitten... At least she thought. She parked in her driveway, shut off the motor, and walked around to the front of the truck. Then she heard a faint "meow" coming from under the hood. One of the kittens had stowed away and was now wedged tightly into a spot on top of the front axle. The kitten rode there all the way home and appeared none the worse for it. But she couldn't liberate the kitten and the kitten couldn't liberate herself. Everybody knows what to do in these situations. You call the fire department, of course. I don't know how the fire department originally got into the business of rescuing cats. I don't think they rescue dogs, or any other animals. But they came to the rescue this time, as they often do. They jacked up the front of Debby's truck, and managed to safely retrieve the kitten. Debby suggested that the fireman hero name the cat. He called it "Axel" of course. When Debby told her sister about Axel, she said she had found two other kittens under the hood of one of their cars after Debby left. Axel was exceptionally lucky. He was somewhat traumatized, hardly scratched, and certainly alive. This type of situation is not an easy thing to prevent. Making noise by banging on the hood or honking the horn is worth a try but it may just make a hiding cat hunker down even more. To be certain, you have to open the hood and take a good look around the engine compartment - and on the front axle! That's just the thing you want to do every morning before you go to work, especially when you're having a bad hair day to start with, you're running late, and it's cold or drizzling outside.